We used a calibrated coupled climate–hydrological model to simulate Meuse discharge over the late Holocene (4000–3000 BP and 1000–2000 AD). We then used this model to simulate discharge in the twenty-first century under SRES emission scenarios A2 and B1, with and without future land use change. Mean discharge and medium-sized high-flow (e.g. Q99) frequency are higher in 1000–2000 AD than in 4000–3000 BP; almost all of this increase can be attributed to the conversion of forest to agriculture. In the twentieth century, mean discharge and the frequency of medium-sized high-flow events are higher than in the nineteenth century; this increase can be attributed to increased (winter half-year) precipitation. 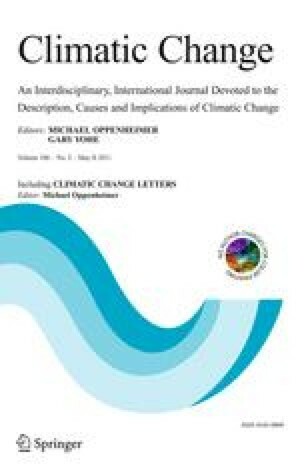 Between the twentieth and twenty-first centuries, anthropogenic climate change causes a further increase in discharge and medium-sized high-flow frequency; this increase is of a similar order of magnitude to the changes over the last 4,000 years. The magnitude of extreme flood events (return period 1,250-years) is higher in the twenty-first century than in any preceding period of the time-slices studied. In contrast to the long-term influence of deforestation on mean discharge, changes in forest cover have had little effect on these extreme floods, even on the millennial timescale.